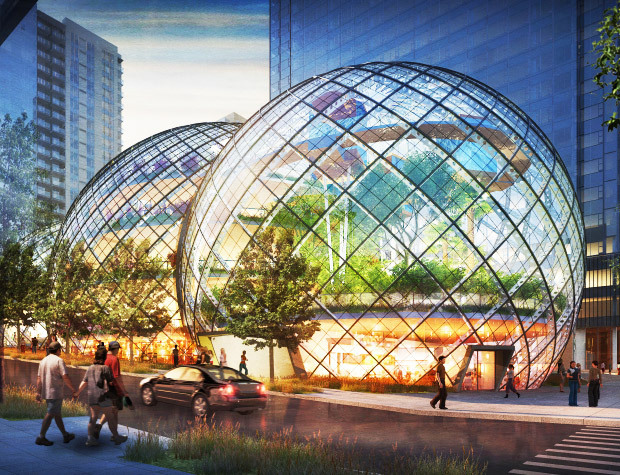 NBBJ unveiled plans for Amazon's Seattle Headquarters back in the fall of 2012 - but they just announced plans to add three striking biospheres to the heart of the 3-block downtown campus. 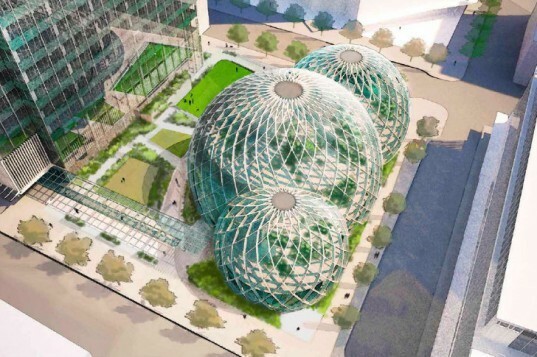 Intended for employees only, the glass spheres will be filled with plants from around the world. The goal is to create a working environment that is more park-like and exciting than a typical 'vanilla' office space. Surrounding the LEED Gold-designed biospheres is a much larger and improved public park than was originally part of the plan. Amazon’s new Seattle campus will revamp three blocks in the Denny Triangle area in between South Lake Union and the commercial core. The plan calls for three 37-story towers complemented with lower volumes, open space, parks, green roofs and art installations. Originally, the heart of the campus contained a public park and a low rectangular volume, which was rather nondescript in design – although it did have a green roof. NBBJ is shaking things up a bit with their more striking plan to add three biospheres to the project. The largest dome will be 130 ft in diameter and the smallest about 80 feet in diameter. Inside, the spherical volumes will hold a variety of workplaces, dining areas, meeting rooms, lounges and public retail spaces on either end. The botanical zones will feature a range of plants, including mature trees from high-elevation climates that prefer temperatures between 68 and 72 degrees. The highly transparent steel and glass structures would be filled with daylight and fresh air. NBBJ will design the structures to meet LEED Gold certification, which will help minimize energy use. The spheres will be located in an improved public park that enhances the streetscape and reduces impact from shade and shadows. 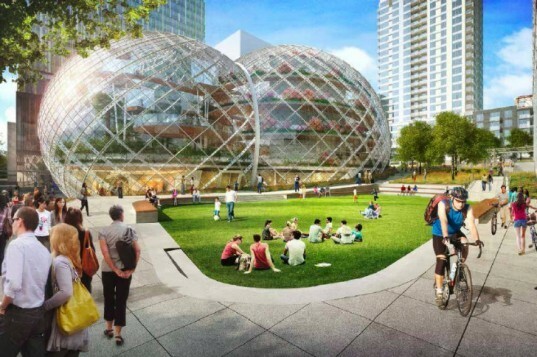 According to the Seattle Times, Amazon and NBBJ met with the city design review board this week to share the new plans. The plans were met with mixed reviews, although the consensus is that the biosphere plan is better than the old design. Amazon hopes to finish the project by 2016. Amazon's new Seattle campus will revamp three blocks in the Denny Triangle area in between South Lake Union and the commercial core. The plan calls for three 37-story towers complemented with lower volumes, open space, parks, green roofs and art installations. Originally, the heart of the campus contained a public park and a low rectangular volume, which was rather nondescript in design - although it did have a green roof. NBBJ is shaking things up a bit with their more striking plan to add three biospheres to the project. The largest dome will be 130 ft in diameter and the smallest about 80 feet in diameter. Inside, the spherical volumes will hold a variety of workplaces, dining areas, meeting rooms, lounges and public retail spaces on either end. The botanical zones will feature a range of plants, including mature trees from high-elevation climates that prefer temperatures between 68 and 72 degrees. The highly transparent steel and glass structures would be filled with daylight and fresh air. NBBJ will design the structures to meet LEED Gold certification, which will help minimize energy use. The spheres will be located in an improved public park that enhances the streetscape and reduces impact from shade and shadows. According to the Seattle Times, Amazon and NBBJ met with the city design review board this week to share the new plans. The plans were met with mixed reviews, although the consensus is that the biosphere plan is better than the old design. Amazon hopes to finish the project by 2016. Design process to change the office into one with a strong focus on landscaping, public space and an exciting place to work.